A 9-point lead with nearly 22 minutes to play wasn’t enough Sunday for the bumbling, stumbling Cincinnati Bengals, as Dallas’ Dan Bailey nailed a 40-yard field goal at the buzzer for a 20-19 win. The loss puts the Bengals at 7-6, and about the only good thing to happen all day took place on the scoreboard, where both Pittsburgh and Baltimore lost, giving the Bengals still a shot at the playoffs. It appears that the playoffs will simply come down to one game – in Pittsburgh in two weeks. If the Bengals though trip up against the Eagles on Thursday, then they probably can start making vacation plans a bit early. New Bengal kicker Josh Brown nailed a 52-yard field goal to give Cincy what seemed to be a safe 19-10 lead with 6:45 to play in the third quarter. Dallas cut the lead to two when Tony Romo hit Dez Bryant down the middle for a 27-yard touchdown with 6:35 to play. The Cowboys then got the ball back at their own 28 with 3:44 to play, and went on a drive to set up the winning score. There were no big gains in the 13-play drive, but the 50 yards gained were enough for Bailey to hit the winning kick, and send the Bengals fans home shaking their heads. The Cowboys were playing with heavy hearts, as Saturday they lost practice-squad linebacker Jerry Brown in a car accident that also involved defensive lineman Josh Brent, who is being charged with the murder as he was intoxicated when the accident took place. Andy Dalton was 20 of 33 for 206 yards with five sacks, one touchdown and an interception that Brandon Carr returned 37 yards to set up DeMarco Murray’s 1-yard touchdown dive in the second quarter. Thursday the Bengals will take on the Eagles, in now what is a must win for the cats. 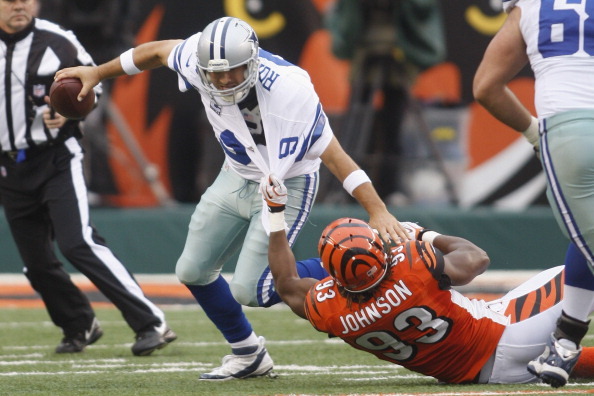 Most NFL Lines have the Bengals as an early 3-point favorite in the game.